In a matter of days we’ll be studying Martin Luther King Jr.’s life and what a celebration it will be. His character and passionate influence left a permanent imprint in our cement. His words moved our thinking to the other side of the world. But the story didn’t end in 1968. As your students use the new lesson on his life, they can begin to dream their own dreams and learn to write poignant speeches that will persuade others about ideas they believe are worthwhile. In this ready to use lesson plan for Martin Luther King day your students learn about the leadership of Martin Luther King Jr., verbalizing their dreams for the world, learn to influence others with a speech, influence others by using MLK quotes and compare/contrast leadership styles. Click here to use the Martin Luther King Jr. Lesson Plan on your interactive whiteboard. The leadership of Martin Luther King Jr. In this lesson plan you’ll find video content all ready to go within the lesson, so you don’t have to worry about disappearing links and remembering which clip had appropriate content. Gynzy does all the previewing for you. There is also a great discussion page which will get your students thinking about what they’d like to see changed in the world. 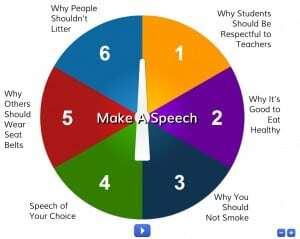 You’ll find pointers on the elements of a great speech and a spinner activity where students speak extemporaneously on a topic. Remember you can customize the lesson to something you’ve recently been working on. 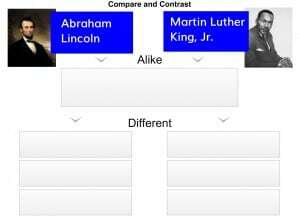 You can use the compare and contrast chart to do some deep level thinking about the different styles of leaders we’re familiar with like this page that compares King with Lincoln. The lesson is just a firm foundation for your own creativity and lesson content. So, all who are in favor of integrating this lesson into a memorable day for you and your students? Step to the front of the bus, stop at the drinking fountain of your choice, and boldly take your place at the head of the class. This is one opportunity everyone has access to. Click here to use this lesson plan on your smart board.